Ready for some kitchen love, the main purpose of a kitchen is cooking of course, I am a terrible meal planner or just coming up with ideas for dinner, so I am constantly getting cooking magazines in the mail, and I always look through them, I just get so overwhelemed or forget which magazine had the recipe I wanted to make. There are many ways to organize recipes, I choose an easy and affordable route, and take my recipes and but them into a simple binder and call it a cook book! Now I personally love my food magazines hence why I get them in the mail, just sometimes they get to overwhelming when you have so many, and you don’t remeber which recipes was in which book. 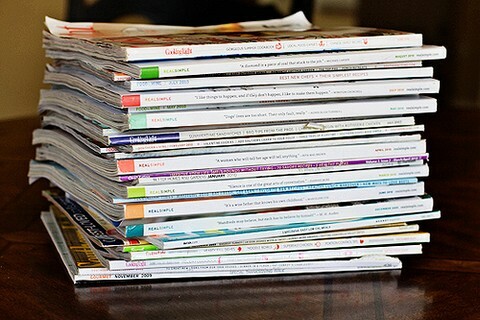 So I took the time to go through each magazine and take out all the recipes I found that would be something I would want to make, and the rest I will either give away or toss in the recycling bin! To make this cute recipe book, I started off with a plain white binder that I already had lying around the house from good old school days! 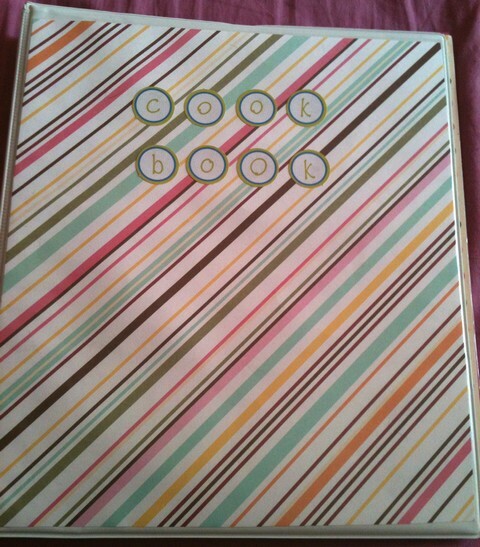 I took a piece of cute scrapbook paper cut it to the size of the binder, took some cute letters from my scrapbook stash and spelt out cookbook! I then filled the binder with plastic sleeves that I actually found at big lots for $3 for a pack of 50, which means you can fill this binder with at least 100 recipes for now, and you can grow it as you go, and eventually buy a bigger binder that can hold more! 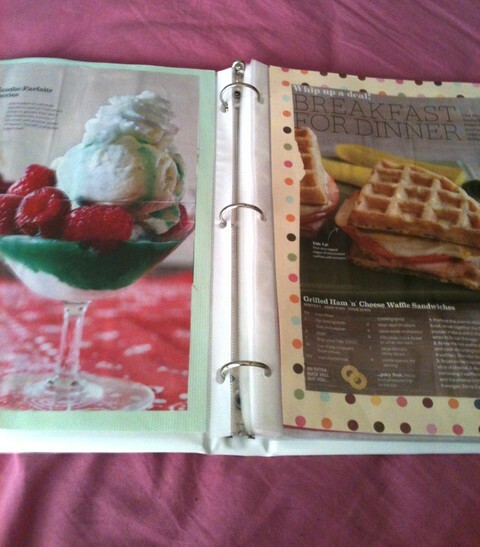 To put the recipes in the book, I again took some of my scrapbook paper, cut it to size, and then used a regular glue stick to paste the magazine clippings to the paper, so that way its more colorful to look at, and the recipes stay in place! This is such an easy and inexpensive way to organize your recipes, no more seaching through magazines minutes before your ready to start cooking! If you have an interesting way to share and organize recipes, or have a great recipe you woud like to share with the readers please do so below!